Just revealed and known as the Opel and Vauxhall Insignia Grand Sport in Continental Europe and the UK respectively, this is the first fully imported Commodore that will be sold following the end of car manufacturing in Australia in late 2017. The front and front three-quarters views present an elegant, refined appearance, with the two chrome wings and "L" shaped LEDs accentuating the width of the car and imparting a conservative, luxurious impression. However, the styling of the tail is less resolved and perhaps anodyne, judging from the press photos. This is evident when the Commodore is compared to other sedans that are more successful in their attempt to create a short rear deck. Top: 2016 Renault Talisman. Bottom: 2014 Audi A3 Sedan. 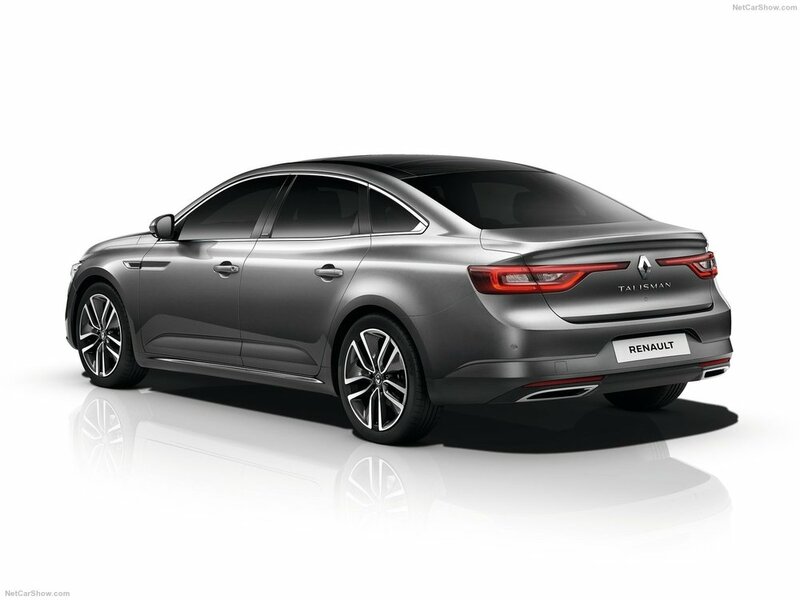 The Renault Talisman, the brand's flagship sedan of a similar size to the new Commodore, is a great example. In this case, the sculpted rear shoulders add a muscular definition to the rear of the car, which together with the rear LEDs that extend towards the centre of the tailgate, accentuate the width of the vehicle. These design aspects combine harmoniously with the crisply defined spoiler, stretching the full width of the tail, and the oversized, central placement of the "Talisman" name to create a refined, luxurious and subtly sporty appearance. The Audi A3 sedan achieves a similar effect but through slightly different means. To alleviate the issue of a bare tail, Audi has integrated the space to install the registration plate within the tailgate, rather than on the lower bumper. By framing this space with a sharply defined crease across the tail lights and adding a full width rear spoiler, the tail of the A3 sedan creates a classy yet aggressive appearance. In contrast, the tail of the Commodore is relatively bland. Whilst it is an inoffensive design that may stand the test of time and age well, it lacks the added sparkle of elegance, power or aggression that sets the Talisman and the A3 apart. Unlike the defined haunches of the Talisman or the crisp full length body line of the A3, the Commodore's side profile implements a faint body line complemented by a character line running below with a needless upwards kick. These design aspects contribute little to developing the overall styling of the vehicle. The tailgate is similarly plain, with an understated spoiler and simple crease below the rear lighting not being out of sync with the front of the car, but also not developing the same theme of elegance or being particularly exciting to the observer. There has been significant controversy that Holden has decided to keep the Commodore name instead of selling this new model as the Insignia, as it is known in other regions. Holden has clearly taken the cautious approach with this decision. The Commodore name in Australia is well known, and retaining this name will help ensure that sales remain consistent amongst private buyers and fleets, which will make up a significant proportion of the model's sales volume. As long as the new model retains the qualities that the current, Australian made Commodore is renowned for, such as spaciousness and a comfortable ride ideal for touring long distances, keeping the name isn't an inappropriate decision. Enthusiasts may argue that the switch to a FWD (front-wheel-drive) drivetrain and the dropping of the V8 engine is a betrayal of long-standing Commodore ethos, and whilst the demise of Australia's four-door muscle car is certainly deplorable, these two characteristics are unlikely to matter in the eyes of the fleet manager or average private sales buyer that make up the vast majority of Commodore sales. For the enthusiast, the impending AWD (all-wheel-drive) V6 Commodore and V8 sports car will be sufficient replacements. What Holden does lose by retaining the Commodore name is the opportunity to substantially reposition and rebrand its sedan offering. The Commodore name in Australia is well known, but it is not universally well loved. It arguably carries the baggage of being perceived as unsophisticated, dowdy and bogan. Retiring the Commodore name would give Holden the opportunity for a completely fresh start, and the ability to move its sedan range into the more lucrative and profitable premium end of the market, and compete directly with Volkswagen, Skoda and possibly cheaper versions of the Mercedes C-Class. For Australia, the 'Insignia' name was originally launched as part of the ill-fated German Opel marque, designed to compete directly with Volkswagen. Thus, it already has a semi-premium brand recognition with customers, and keeping it as part of the Holden stable would give the company an untainted opportunity to reposition its sedan lineup in line with its desire to be perceived as "a lifestyle brand." Ultimately, if Holden genuinely wishes to reposition itself as a whole, it needs to make tough decisions. Sourcing premium new models from Europe, such as the new Astra, is a crucial aspect of this but so is taking risks and dropping unsuitable brands. A premium product requires a premium brand, and the Commodore name simply does not pass this test. Critics of this view may liken Holden's decision to keep the Commodore name an appropriate one in light of the failure of previous rebrands, such as that of the Nissan Pulsar to the Nissan Tiida from 2005-2013. Left: 2005 Nissan Tiida. Right: 1999 Nissan Pulsar SSS hatchback. Image credit Wikimedia Commons. The Pulsar was a well-loved, relatable name with some popularity in enthusiast circles for sporty variants such as the "SSS" specification. By abruptly changing the name to the hard to pronounce and oddly spelt "Tiida", Nissan abandoned customers' trust and goodwill in the Pulsar brand, with sales of the new model consequently faltering. However, this is not an apt justification for Holden to keep the Commodore name in favour of Insignia. Not only was the Tiida name confusing due to its odd spelling and unclear pronunciation, more importantly it was a poor product. From this writer's personal experience with the vehicle as a rental car, the Tiida had staid styling, the steering feel of a video game and lacked stability (and was prone to buffeting) at highway speeds due to its skinny tyres. On first impressions at least, the Insignia is fundamentally not a terrible product and the name, while not having the same universal recognition as Commodore, carries a clear intention as an almost literal flagship of the Holden range. Just like the rest of the car, Holden's decision to keep the Commodore name is an inoffensive one, but a decision that perhaps misses the big picture.